Lipikar Body Lotion for Normal to Dry Skin is a lightweight body moisturizer that helps replenish skin's essential lipids and provide all day hydration, leaving the skin feeling smooth. 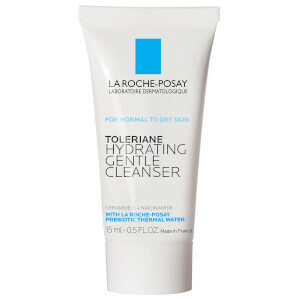 Its formula contains a high concentration of La Roche-Posay Prebiotic Thermal Water known for its hydrating, soothing, and antioxidant properties, Shea Butter & Glycerin, moisturizing agents that naturally attract water to skin, Niacinamide, a form of vitamin B3 with soothing properties. Lipikar Lotion is a cold cream-based formula, an emulsion of water and natural oils to help replenish skin's essential lipids. Use as a daily body lotion all year round to help keep skin smooth and moisturized. This lightweight lotion absorbs quickly and leaves a non-greasy and non-sticky finish. Suitable for babies six months and up, children and adults. Provides long lasting comfort & all day hydration. Lipikar Lotion is an all over body moisturizer that provides all day hydration and replenishes skin's essential lipids for normal to dry skin. Use daily all over the body all year round to help keep skin smooth, moisturized, and healthy-looking. Use as a daily body lotion for normal to dry skin. Apply all over the body on clean skin morning and evening. Gently massage product until absorbed. Aqua / Water, Butyrospermum Parkii Butter / Shea Butter, Glycerin, Sorbitan Stearate, Paraffinum Liquidum / Mineral Oil, Niacinamide, Brassica Campestris Oleifera Oil / Grapeseed Seed Oil, Aluminum Starch Octenylsuccinate, Dimethicone, Cera Alba / Beeswax, Sorbitan Tristearate, Carbomer, Sodium Hydroxide, Poloxamer 338, Ammonium Polyacryloyldimethyl Taurate, Disodium Edta, Sucrose Cocoate, Caprylyl Glycol, Citric Acid, T-Butyl Alcohol, Cetyl Palmitate, Bht, Pentaerythrityl Tetra-Di-T-Butyl Hydroxyhydrocinnamate, Chlorhexidine Digluconate.